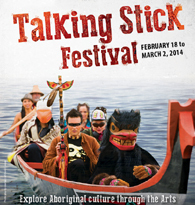 As founder and artistic director of Full Circle: First Nations Performance, Margo Kane was on hand last Tuesday (Feb 18) to launch the thirteenth Talking Stick Festival in the Roundhouse Exhibition Hall. Guests at the Wax hoks en Shqulawin Gala Opening saw Zaccheus Jackson compère an eclectic mix of music and dance with Innu artist Kathia Rock joining Metis band Kawandak. Last night (Feb 21), Ms Kane opened what will likely be one of the festival’s marquee events, For the Pleasure of Seeing Her Again by Montreal playwright Michel Tremblay. Kane plays Nana, in what is essentially a warm-hearted tribute to the author’s own mother seen in flashback through a combination of memory and imagination. Set in Montreal in the 1950s, the play is ingenious in its simplicity, with Tremblay himself installed as The Narrator, played by Niakap’amux actor Kevin Loring. It begins with Loring taking to the stage and setting out to shape audience expectations by telling what it isn’t about, while subtly creating a portrait of the subject. Kane enters the stage through a central sliding door wearing a simple dress, an apron and hair cover with a red scarf tied in a knot above the forehead. She takes over the dialogue like a windstorm, as Loring simultaneously shifts gears from narrator to role-player. First, representing Tremblay as a mischievous ten-year-old on the receiving end of a scolding for getting caught (actually, being ratted out by his friends) throwing slabs of ice under moving vehicles. Tremblay’s homage continues through a series of colourful vignettes with pivotal stop-overs at ages: thirteen, fifteen, eighteen and twenty. Loring wisely opts for a transparent performance allowing Kane to give an unfiltered interpretation of Nana. The role appears to fit Margo Kane like a well tailored glove. Tossing out wildly exaggerated stories and accepting any trifling comment as personal criticism, she makes us chuckle at almost every line. Even with such sharp dialogue as put forward here, anecdotal monologue can still wear thin on the audience if too pedantic, but director Glynis Leyshon gets the pacing just right. If there was a single fault with the direction, it may be how the last scene is handled in the maladroit volte-face from realism to surrealism.